Although the Royal Palace is the official royal residence, it is mainly used for functions and is one of three palaces that the royal family of the Netherlands reside in. Visitors should check the calendar on the official website listed below to ensure that the palace is not closed for an event during their stay, but it is open most days of the year. 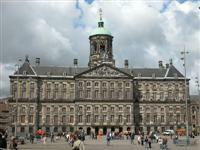 The building dates back to 1648 and was originally designed for use as Amsterdam's City Hall. A large collection of furniture from this period adorns its magnificent interiors and there is also some valuable art on display. The palace is comparatively small by European standards and only part of it is open to visitors, but exploring it is still a fantastic experience, helped along by an excellent free audio guide which gives a great history lesson. Guided tours are offered to visitors (although they must be booked two weeks in advance) and they are conducted by qualified art historians or art history students in Dutch, English, German, French and Spanish. Official tours take about an hour, but those who are exploring alone with the audio guide may take up to three hours if they linger and listen to all the information provided. Photography is permitted in the palace, but not flash photography. Opening times: Open most days between 11am and 5pm, but closed for royal events. Admission: €10 (adults), under 18s free. Concessions available.